I joined this challenge in 2012 and then didn't post one single book. Bad, Freda! I won't do that this year. 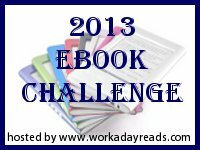 I will post each eBook I read and review, and hope you'll join in if you read eBooks too. That's what my aim will be. As stated in the rules above, you can go up but you can't go down, so if I read more than 10, I'll move on up like the Jefferson's. Good luck to all the challenge participants! Happy eReading! CHALLENGE COMPLETED APRIL 4, 2013.